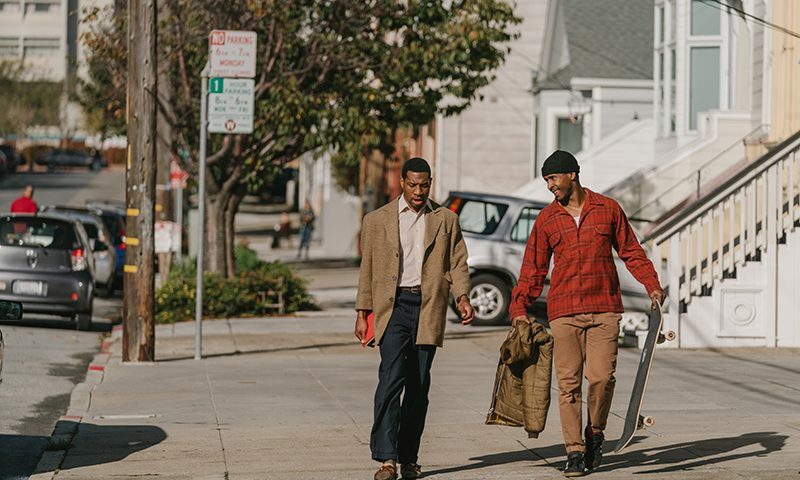 Jimmie Fails and Jonathan Majors appear in The Last Black Man In San Francisco by Joe Talbot, an official selection of the U.S. Dramatic Competition at the 2019 Sundance Film Festival. Courtesy of Sundance Institute | photo by Peter Prato / A24. All photos are copyrighted and may be used by press only for the purpose of news or editorial coverage of Sundance Institute programs. Photos must be accompanied by a credit to the photographer and/or 'Courtesy of Sundance Institute.' Unauthorized use, alteration, reproduction or sale of logos and/or photos is strictly prohibited. The opening scenes of The Last Black Man in San Francisco were enough to take my breath away. A young girl skips playfully on the shores of the San Francisco bay while people in biohazard suits pick up garbage from the ocean around a man who stands on top of a milk crate preaching to an imaginary crowd. 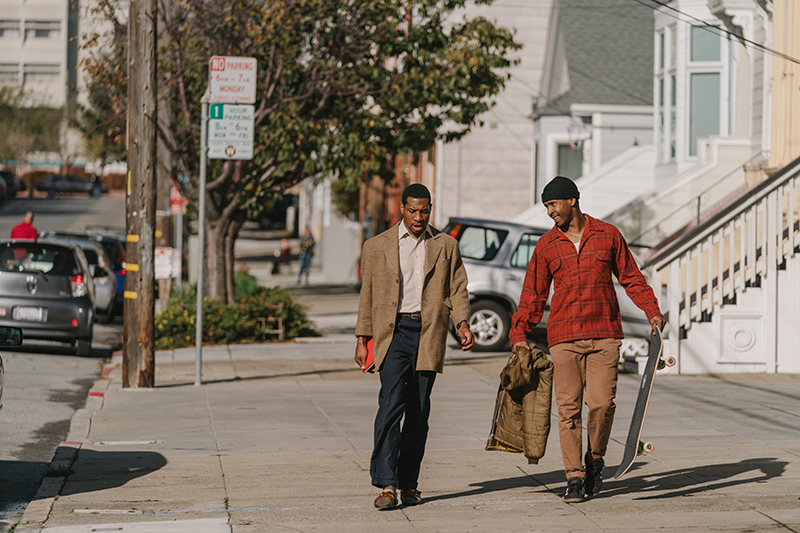 Across the street, Jimmie Fails (played by himself) and his best friend Montgomery (Jonathan Majors) wait for a bus that never seems to come. Montgomery pigtails on the back of Jimmie’s skateboard as they navigate the roads of San Francisco with emotive classical music playing beneath the milk crate preacher’s sermon, meeting the gaze of everyone they pass. Their destination is the house Jimmie’s grandfather built, a gorgeous white and red Victorian mansion near Golden Gate and Fillmore. In what is now a predominantly upper class, white neighborhood, Jimmie obsesses about the house even though another couple lives there, trying to fix up the exterior when they are not home. Jimmie seizes his opportunity when the owner is forced to vacate over an estate dispute, breaking into the house and squatting there with his friend Montgomery. While Jimmie spends his days fixing the house and re-painting, Montgomery, a soft-spoken, odd ball with an undeniable artistic eye, works on the play he is writing. Montgomery’s play becomes based on his tough, intimidating, tattooed peers who loiter outside his grandfather’s house roasting each other, challenging each others masculinity. Specifically, he is drawn to Kofi, (Jamal Trulove), the one in the group with the most pain in his eyes, as if this isn’t the sort of life he wants to be living. So much of the mythos around this story involves Jimmie’s connection to the house, and how the house ends up representing a part of Jimmie’s past that he can’t let go of. There is a sense of displacement and upheaval in Jimmie’s life. It becomes clear that for Jimmie, the house, and San Francisco at large, represent a sense of belonging and a large part of his identity, even as the city is pushing him out. One subtle example of this is when the house is originally appraised as being just shy of a million dollars, when, towards the end of the movie, it is appraised at around 4 million, putting Jimmie’s goals even further out of his reach. The cinematography of The Last Black Man in San Francisco is intoxicating and beautiful. Transition scenes of Jimmie skateboarding and hitching on the back of vehicles to get around the city would normally seem mundane, but the score and unique camera angles used to capture these moments becomes ingrained in the psyche. In one scene, Jimmie and Montgomery ride the bus and run into Jimmie’s mother. The camera points at them head-on, panning from Jimmie’s mother to Jimmie as they awkwardly catch up on opposite sides of the bus. San Francisco fog permeates the background, bathing both in an almost angelic ether as they make plans for Jimmie’s mother to come by the house. For me, these scenes, even though they may not have been essential to the plot, serve as stanzas in a visual love letter to San Francisco.